This book, first published in 1986, presents a radical challenge to socialist orthodoxy, subjecting a key component of that orthodoxy – Marxism – to sustained criticism. 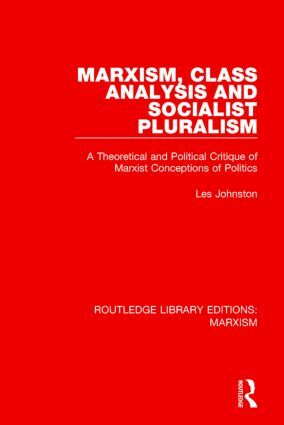 Les Johnston argues that Marxism cannot provide the foundations for a rigorous socialist theory or an effective socialist politics. A fundamental element of this criticism is the suggestion that the problem of ‘reductionism’ which has preoccupied Marxists is a red herring. Marxism’s problem is not its reductionism but its theoretical incoherence. Marxism is not ‘deterministic’, for there is invariably an indeterminate relationship between the materialism it invokes and the forms of politics it adopts. However, materialism is an obstacle to socialist theory. The contradictions and failures of Marxist class analysis suggest that the class concept is inadequate to the demands that socialists continue to place on it. It is not merely class which is problematic, however, but the conception of political interests which is associated with it. Even recent Marxist ‘revisionists’ who dispense with class primacy are unwilling to come to terms with the question of how socialist political interests are constituted. Socialist theory has to recognise the varied forces and interests on ‘the left’, and an effective socialism will have to be a pluralistic one. This means there can be no general theory of socialism, since a pluralistic socialism has to be able to adjust to varying social conditions.